Diese schönen Schlafzimmer ziehen meine Augen magisch an. Wunderschön, vor allem das untere mit dem schönen Holzboden ist toll! Stunning!! I can picture myself sleeping, cooking,tanning…whatever in that gorgeous villa from the second picture! I think I would spend every summer night on that terrace on the 1st floor. ps: how would you like to enter my blog anniversary giveaway? Schlafen wie unter freiem Himmel – himmlisch! I wouldn´t be able to sleep in such a beautiful place… it would be like loosing my time! 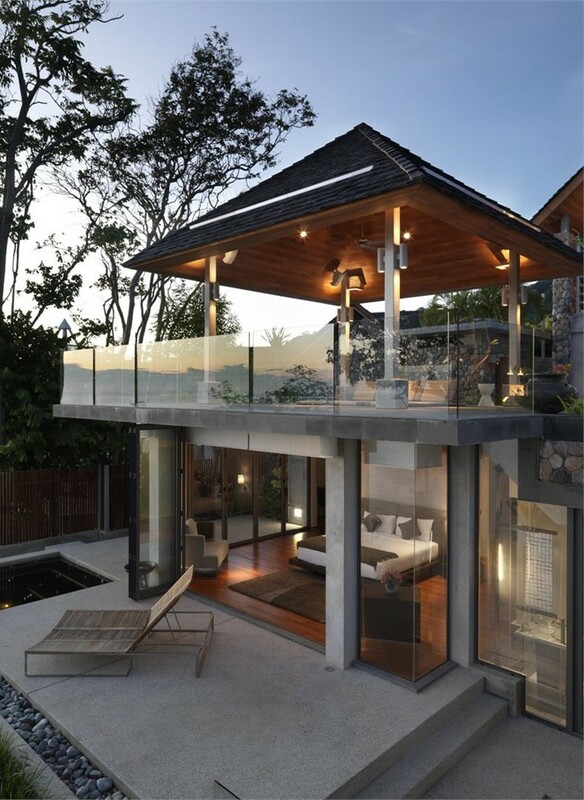 The balcony glass is very chic. I just want to be chillin’ in that first image for sure! Maria, these images are fantastic. I wonder how nice could be wake up in this bedroom with this amazing view. Your images are wonderful, too. Talk about architecture in great harmony with mother nature! Hope all is well with you lovely Maria. I have no blog energy this summer… Where do you get yours from?! So peaceful. Love the thoughtful, zen landscaping and use of natural materials. I’m with Splendid Willow re: harmony!